Gaylord Opryland is world-renowned for its first-class entertainment and attractions, service and nine acres of extraordinary garden environments all under glass. Five ballrooms from 3,364 to 55,314 sq. ft.
Gaylord Palms features regional Florida-themed atriums, including the old-world charm of St. Augustine, the colorful spirit of Key West and the mystic essence of the Everglades. Three ballrooms from 3,115 to 48,505 sq. ft.
Gaylord Texan is a dramatic resort hotel and convention center, overlooking Lake Grapevine and brimming with authentic Texas style and Lone Star hospitality. Four ballrooms from 3,306 to 49,025 sq. ft.
Gaylord National is the largest combined hotel and convention center on the Eastern Seaboard, strikingly situated on the banks of the Potomac River. Five ballrooms from 7,957 to 51,462 sq. ft.
Six outdoor event venues from 3,000 to 39,000 sq. ft.
Gaylord Rockies will be the premier Colorado meeting and convention center hotel with sweeping views of the Rocky Mountain foothills. 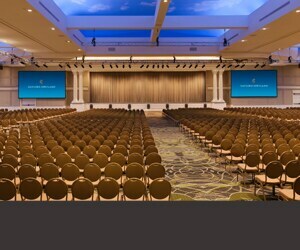 Three ballrooms from 8,000 to 59,736 sq. ft.
Three outdoor event lawns from 13,200 to 39,790 sq. ft.